Rolling element bearings perform vital functions in enabling pumps to achieve their full potential in service. In centrifugal pumps as an application example, bearings support hydraulic loads imposed on the impeller and shaft, as well as loads created by couplings and drive systems. They also keep shaft axial and radial deflections within acceptable limits for a pump’s impeller and shaft seal. But what if a pump application and/or operating conditions will be especially demanding? Recent upgrades in pump bearing designs, engineering, and materials can deliver a significant boost in compensating for adverse conditions, preventing premature failures and, in turn, elevating pump performance to higher levels. Notable examples of bearing upgrades—each offering distinct application advantages—include the use of ceramic material for rolling elements and super-tough steel for bearing rings, specialized wear resistant coatings, and purposely dissimilar opposing contact angles for rolling elements to withstand potential damage resulting from minimal axial loads. Bearings in especially tough pump applications, such as those in the oil and gas and hydrocarbon process industries, typically must accommodate contaminated and corrosive environments, inadequate lubrication conditions, high and low loads, and high or cryogenic temperatures. All the while, they must provide a high degree of service, availability, and safety. Bearing grade silicon nitride, an engineered ceramic material, offers a uniform and clean microstructure, which is extremely hard and 40 percent less dense than bearing steel. As a result, rolling elements weigh less and exhibit lower inertia, which reduces stresses on a bearing’s cage during rapid starts and stops and significantly lowers friction at high speeds. Lower friction translates to cooler running and longer lubricant service life. In addition, silicon nitride demonstrates higher hardness and higher modulus of elasticity than steel to promote increased bearing stiffness and longer bearing service life in contaminated environments. The lower thermal expansion for silicon nitride rolling elements allows for more accurate and stable preload control when temperature gradients exist within the bearings. As an alternative to compensate for very extreme conditions, hybrid bearings can be supplied with high-performance stainless steel rings instead of rings made from conventional steel to promote superior corrosion resistance, longer service life, and ability to tolerate high temperatures. 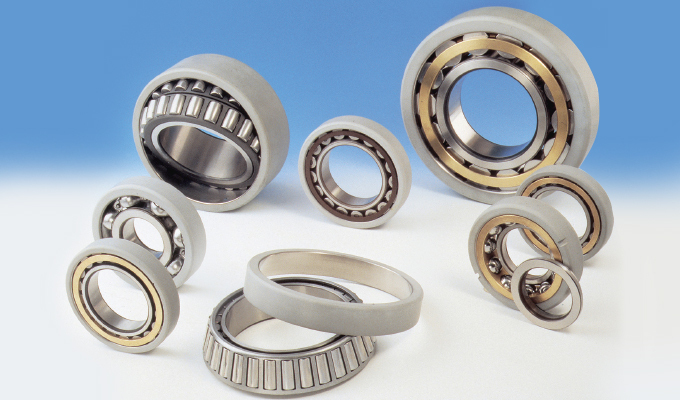 Hybrid bearings can improve bearing reliability and service life in other ways, too. For example, under insufficient or improper lubrication conditions, high speeds and light loads, and/or sudden starts and stops, smearing can occur. (Smearing is surface damage to a bearing due to sliding between the all-steel rolling elements and rings.) However, smearing will not develop between silicon nitride and steel. This ultimately enables hybrid bearings to last much longer in applications operating under severe dynamic or improper lubrication conditions. Designed to overcome several common causes of bearing failures, a bearing can be upgraded with a low friction, wear resistant carbon coating applied to the bearing’s rolling elements and inner ring raceways. The coated bearing surfaces retain the toughness of the underlying material—the coating is actually harder than steel—while adopting the hardness, improved friction properties, and wear resistance of the coating. Unique coating properties also advance high speed capabilities and extend bearing service life. Such coated bearings can withstand a variety of severe operating conditions, including risks of smearing, insufficient lubrication film, sudden load variations, light loads, rapid speed changes, vibration and oscillations, and high operating temperatures. The anticipated outcomes: increased reliability, extended service life, and reduced chances of premature bearing failure due to friction, wear, and related factors. From a bearing engineer’s perspective, 40-degree matching contact angles for pump bearing rolling elements have become the norm for paired single row angular contact bearings in API pumps. For conventional double row bearings used in ANSI pumps, matching 30-degree contact angles are typical. Typically, one of the two rows of rolling elements supports the applied loead. The other inactive row often creates problems with bearing performance due to lack of load. Particularly for the 40-degree paired single row bearings, a change in the contact angle of the opposing, inactive row can benefit many pump applications by promoting smoother operation and longer service life in the way they support loads. Pump bearing arrangements engineered with dissimilar opposing contact angles—a combination of 40-degree and 15-degree—will be capable of carrying high thrust loads with the 40-degree bearing without unloading the opposed 15-degree bearing. Greater axial loads can be applied and the bearing’s operating temperature will decrease. 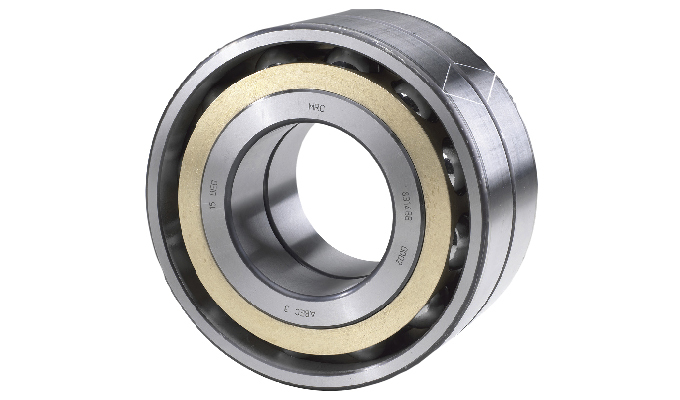 These 40-degree/15-degree angular contact ball bearing arrangements ideally suit applications where the axial load is high in one direction and does not change direction during operation. The bearing sets can additionally accept momentary reversals in axial load, including those that can occur during pump start-up and stops. In centrifugal pumps where thrust loads are light and radial loads predominate—such as double suction impeller pumps or pumps with closed impellers—bearing arrangements featuring pairs of 15- or 25-degree contact angles offer yet another upgrade alternative. Compared with conventional 40 degrees, matched bearing arrangements, the design of these 15- or 25-degree bearings promotes cooler running, substantially reduced vibration, and extended service life in applications with high radial loads. As all these advances illustrate, pump bearing design and engineering is anything but stagnant. Partnering with a knowledgeable and experienced bearings expert can be invaluable in keeping operators in the know and pumps performing as intended—or even better. Brian P. Dahmer is director of application engineering experts at SKF USA Inc. Contact him at brian.p.dahmer@skf.com or 267.436.6517. SKF USA Inc. is the U.S. subsidiary of SKF Group, a world leader in rolling bearings and related technologies including sealing solutions, lubrication systems, mechatronics (combining mechanics and electronics into intelligent systems), and services. Twenty-eight of SKF’s 140 global manufacturing sites are located in the United States, including facilities for the production of seals, lubrication systems, linear motion products, actuation systems, and rolling bearings. For more information, visit www.skfusa.com.